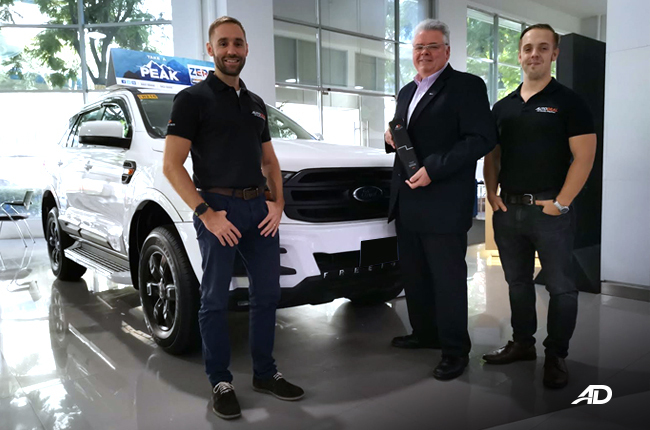 Home Corporate Blog Features How important is vehicle safety to Philippine car buyers? 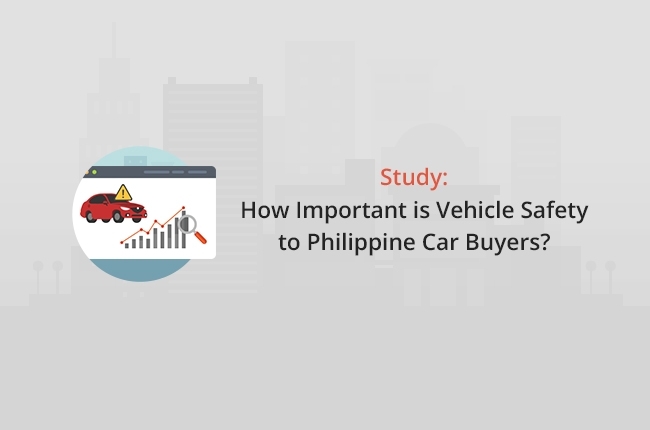 How important is vehicle safety to Philippine car buyers? Last week I gave a presentation at the 7th ASEAN NCAP Automobile Safety Forum related to data surrounding the topic of vehicle safety and what impact it may or may not have on consumer decision making. In other words, do Philippine consumers really compare differences in vehicle safety features when choosing what vehicle to purchase? 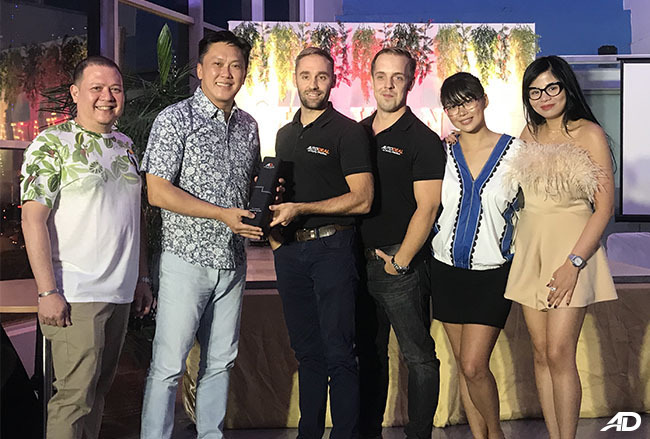 The information that follows is a commentary on the findings of our case study; the data for which has been driven by consumer browsing behavior on AutoDeal.com.ph. My full presentation slides can be found here. i. Safety is the single most important factor. ii. Safety is important, but not the most important factor. iii. Safety is important, but many other factors are more important. iv. Safety is not important at all. Pretty simple right? But ultimately flawed. 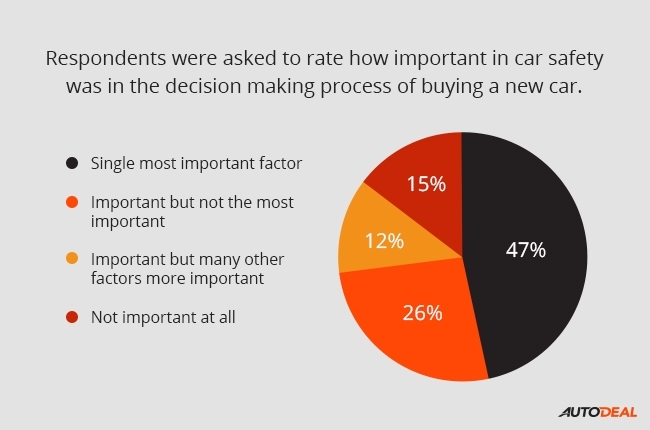 As expected, the results from the survey indicated that a majority of 47% of respondents agreed that safety was the single most important factor, with a further 26% stating that it was important, but the most important and an additional 12% indicating that it was important, but not as important as several other features. 15% of respondents also indicated that safety was not an important factor in the decision making process. While the data might appear to be somewhat conclusive; an evaluation of the survey left me with an assumption that the engagement was highly susceptible to response bias and that respondents were taking on the “good participant role”; a term in Psychology that refers to participants conforming to specific behaviors in order to deliver results that supported the expected hypothesis of the experiment. In addition to this, the process of directly addressing the topic of vehicle safety was likely to drive an incredibly emotive response since it touches on the topic of mortality and becomes related to our innate subconscious fear of death. As such, we decided to look further into the topic of safety by monitoring the way in which online car buyers browse and research through vehicle specifications to discover if browsing trends supported or contested with the findings of the initial survey. A starting stage for this, was to examine their levels of engagement in different types of content. In order to further the experiment, we used our Google Event Tracking data from more than 6,000,000 users from the last 12 months who had browsed through vehicle specifications in the Car Guide section of the AutoDeal website. In particular, we monitored which areas of the vehicle specification page were expanded and engaged with. 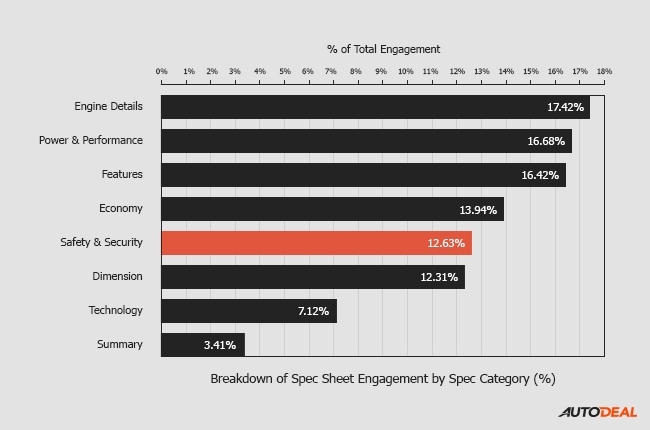 An engagement % score was then awarded based on the split of attention within the different categories. Vehicle specification data is broken down into 7 core categories that include: Engine Details, Power & Performance, Economy & Environment, Safety & Security, Features, Dimensions and Technology. 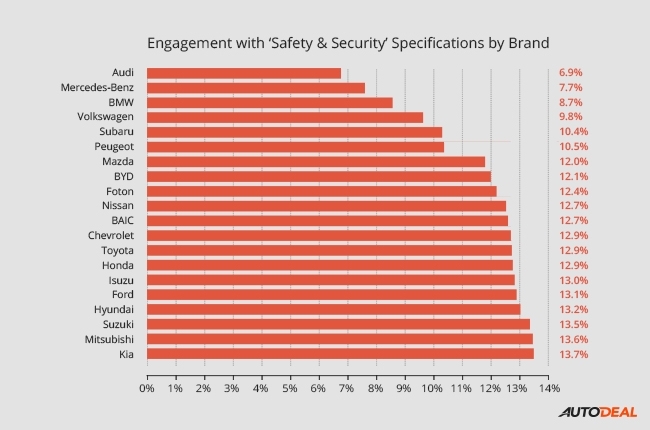 As demonstrated in this graph above, our initial findings indicated that overall safety and security ranked as the fifth highest consideration for car buyers with an engagement score of just 12.63%, falling short to Engine Details, Power & Performance, Features and Economy. As such the initial findings already immediately contest the results of our customer survey. While safety appeared to be important, several other factors related to a vehicle were prioritized by car-buyers when browsing through the AutoDeal website. To further the research, we segmented our findings based on the age range of users (Sourced through Google’s Demographic profiling in Google Analytics). With this, we discovered significant changes in engagement with safety depending on the users age range. We also examined gender, and found no significant difference in preference between males and females. 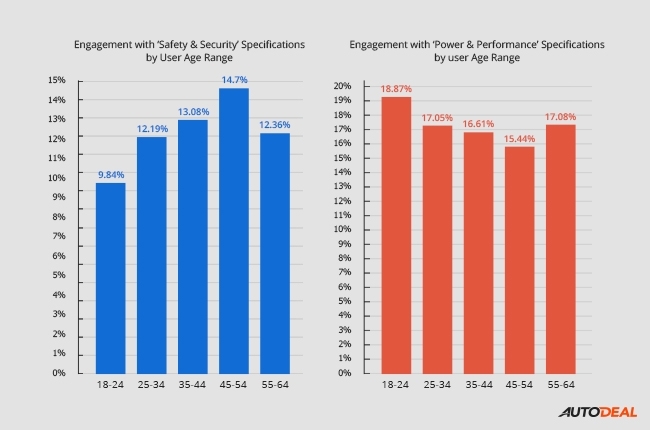 In general, engagement in viewing safety feature information increased significantly as age ranges increased. This escalated up until the 55-64 age range, when the engagement % dropped slightly. The 45-54 year old age range showed the highest engagement of 14.7% with safety whereas the 18-24 year old age range showed the lowest engagement with a score of just 9.84%. In addition to this, when we reviewed the Power & Performance category, we saw a stark polar contrast with safety as younger demographics prioritized information related to a vehicles output and speed over it’s incumbent safety features. Some possible rationales for this behavior could be that attentiveness to safety features increases among age ranges which are more likely to have an increased number of passengers due to factors like child rearing and the associated responsibilites of protecting the family unit. The drop in attentiveness to safety showcased by the 55-64 year old range, could be the result of a transition out of this particular mindset. As children grow up and become more independent (and become vehicle owners themselves), mum or dad might no longer have to persevere with practical choices like MPV’s and may prioritize their buying habits to be focussed more on features like comfort and technology. Likewise, the 18-24 age ranges lack of interest in safety and increased focus in power and performance might be related to a fallacy of invincibility which is often related to increased risk taking or the adoption of the ‘it won’t happen to me’ mentality by younger generations. Like many things in life, this is a sad irony as unintentional injuries such as automobile crashes remain to be some of the highest causes of morbidity and mortality in young people (based on US data). We further cross referenced the data based on the brands in which consumers were viewing. Initial results showed that premium-level brands scored very low engagement rates with safety. This may have occurred possibly due to pre-conceived concepts about specific brands on the rationale that a premium level vehicle will surely come with premium level safety features. As such the need for potential buyers to research about safety features may feel redundant given their strong pre-conceptions. 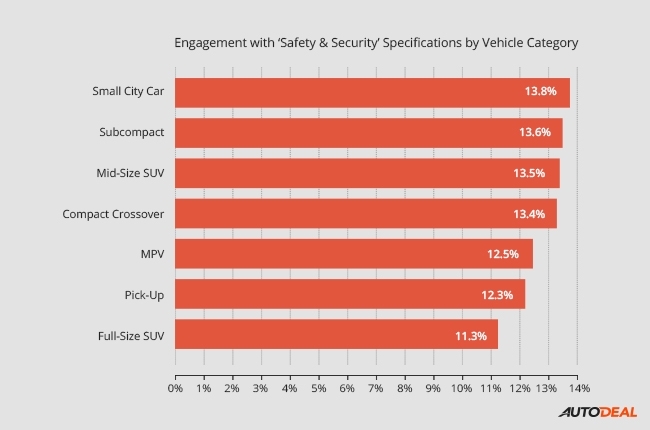 In addition to this, we also noted that there were some minor differences in engagement between different vehicle categories; with lower priced vehicles often receiving increased engagement. As we’ve discussed in some of our previous industry reports; the Philippine car buyer is incredibly concerned over value for money. The apparent increased focus on vehicle safety among subcompact’s and small city cars may be the result of consumers being conscious about cutting costs without sacrificing too heavily on safety features. As a result, consumers in this segment are more likely to expand the safety and security sections of our car variant pages to check on the volume of safety features, thus creating the higher enagement. 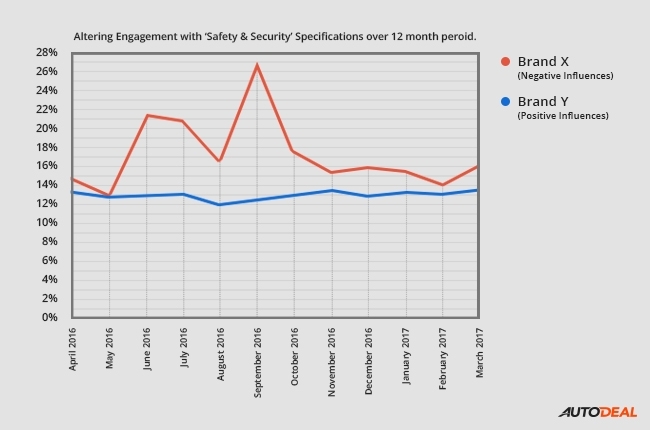 As a final test for this study, we examined the engagement in safety across two brands over a period of 12 months and calculated monthly variance in consumer engagement levels. For Brand X, we chose a brand that had over the course of the 12 month period, experienced negative media attention related to alleged safety issues. For Brand Y, we chose a brand that maintains a consistent marketing message on the integrity of its safety features. As shown by the graph above, Brand X experienced volatile changes to its user engagement at specific times of the year before eventually decreasing to more normal levels by the beginning of this year. Brand Y however had no significant changes in consumers engagement with its safety features. These findings lead us towards a hypothesis that negative connotations or crisis situations related to vehicle safety may have an increased impact on consumer behavior than maintained positive messaging. As such, since positive messaging appears to have no real impact on reducing engagement with safety features, the process of a brand recovering after an apparent safety crisis could be an incredibly complex (and costly) situation to reverse. As demonstrated in the series of tests; it’s apparent that vehicle safety does impact consumerism but has mixed relevance depending on consumer demographics and vehicel segements. Likewise, much in the same way that Airlines suffer losses following fatal crashes, automotive brands too risk increased concern over safety features when negative attention is drawn to their brand. As motor vehicles continue to evolve, it may be prudent to suggest that consumers already come to the market with a pre-conceived notion that the vast majority of mainstream vehicles come with a good standard of safety measures. This rationale is supported by our series of tests which indicate that consumers are often far more interested in other features like performance, economy and comfort features when comparing vehicles. Increased engagement with safety features appears to more commonly occur for brands that have been tainted by a negative incident related to their brand and safety. Drawing correlations between these figures and vehicle sales for a specific brand may be the logical next step for future studies in order to determine if these spikes in engagement have a positive or negative impact on retail sales. 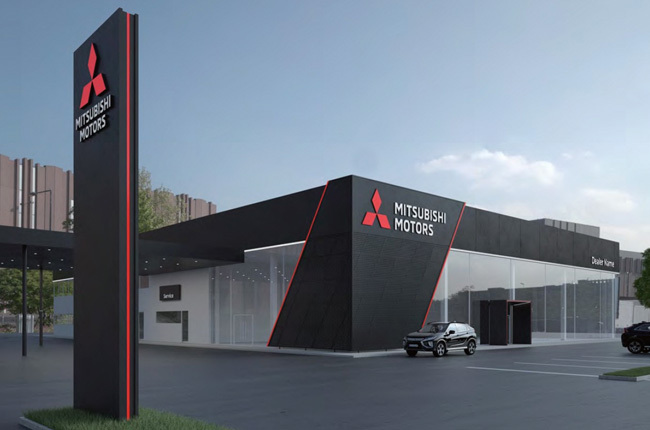 For now, it appears that consumers only become truly concerned about a vehicles safety feature when they’re paying for lower-priced vehicles or when a negative stigma is creating. Using similar data sources, brands may (over time) be able to eventually build a forecast model that will enable them to measure the impact of a relevant crisis and predict how long it may disrupt their given market for and estimate what kind of financial liability it will create. In closing, while day-to-day consumer interest might vary on a case to case basis, it is apparent that a brands safety reputation is a indeed a fragile thing that may only have real consequences with consumer decision making when the said reputation is brought into contest.